"Brachy" means "shortened" and "cephalic" means "head". The skull bones of brachycephalic dogs are shortened in length, giving the face and nose a "pushed in" appearance. Due to the shorter bones of the face and nose, the anatomy and relationship with the other soft tissue structures are altered; some of these changes can cause physical problems for the affected dog. Examples of breeds that are brachycephalic include Bulldogs, Boxers, Boston Terriers, Pekingese, Chinese Pugs, Lhasa Apsos, Shih Tzus and Bull Mastiffs. Brachycephalic airway syndrome refers to a particular set of upper airway abnormalities that affects brachycephalic dogs. This syndrome is also calledbrachycephalic respiratory syndrome, brachycephalic syndrome or congenital obstructive upper airway disease. The upper airway abnormalities that occur in this syndrome include stenotic nares, an elongated soft palate, a hypoplastic trachea and everted laryngeal saccules. An individual dog with brachycephalic syndrome may be affected with a combination of one or more of these abnormalities. Dogs with stenotic nares have abnormally narrowed or small nostrils; the narrowing restricts the amount of air that can flow into the nostrils. 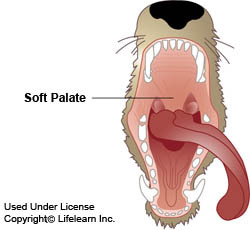 A dog with an elongated soft palate (the soft part of the roof of the mouth) has a soft palate that is too long for the length of the mouth; the excess length partially blocks the entrance to the trachea at the back of the throat. A hypoplastic trachea means that the trachea or windpipe has a smaller diameter than normal. The laryngeal saccules are small sacs or pouches that are located just inside the larynx (voice box); these saccules evert (turn outwards) or are sucked into the airway by pressure associated with the increased respiratory effort caused by the stenotic nares and/or the elongated soft palate. Everted laryngeal saccules will further obstruct airway flow. What are the symptoms of brachycephalic airway syndrome? Any of these upper airway abnormalities can cause increased airway resistance, increasing the effort required to inhale. Most dogs with this syndrome are able to breathe more easily through their mouth than their nose. Generally, the more abnormalities present the more severe the symptoms. "Generally, the more abnormalities present the more severe the symptoms." Mildly affected dogs will have noisy breathing, especially with exercise, and most will snort when excited and snore when relaxed or asleep. Severely affected animals have more pronounced airway noise, appear to tire easily with exercise, and may collapse or faint after exercise. Other symptoms may include coughing, gagging, retching and vomiting. Symptoms are often worse in hot or humid weather. "Symptoms are often worse in hot or humid weather." Most dogs are diagnosed with brachycephalic airway syndrome between 1 and 4 years of age, with a range in ages from less than 1 year to as old as 11. Both males and females appear to be affected equally. Dogs with multiple abnormalities tend to develop problems at an earlier age. If you have a brachycephalic dog, your veterinarian may discuss this syndrome with you as part of a routine health examination, or you may bring your dog in for an examination because of an episode of respiratory distress or a fainting spell. This syndrome will be diagnosed on the basis of the dog's breed, clinical signs and results of a physical examination. 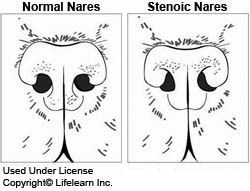 Stenotic nares can usually be diagnosed on visual inspection. 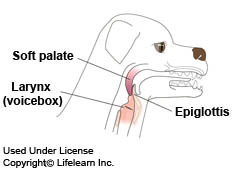 Diagnosis of an elongated soft palate, everted laryngeal saccules or other associated anatomical changes in the mouth will require heavy sedation or full general anesthesia. 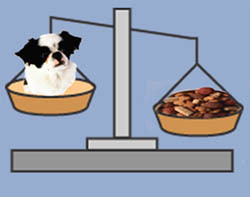 "Since obesity worsens the symptoms of brachycephalic airway syndrome..."
Since obesity worsens the symptoms of brachycephalic airway syndrome, weight loss is an important part of treatment if the pet is overweight. For dogs with only mild or intermittent symptoms, their condition may be managed conservatively by controlling exercise levels, avoiding hot or humid conditions, keeping the dog in an air conditioned place during the summer, and avoiding stress. Corticosteroids, non-steroidal anti-inflammatory medications and oxygen therapy may all be useful for short term relief of airway inflammation or respiratory distress. However, medical management of this condition does not correct the underlying anatomical abnormalities. Surgery is the treatment of choice whenever the anatomic abnormalities interfere with the patient's breathing. Stenotic nares can be surgically corrected by removing a wedge of tissue from the nostrils, allowing improved airflow through the nostrils. An elongated soft palate can be surgically shortened to a more normal length. Everted laryngeal saccules can be surgically removed to eliminate the obstruction in the larynx. "The earlier that the abnormalities associated with this syndrome are corrected..."
The earlier that the abnormalities associated with this syndrome are corrected, the better since the condition worsens over time and may cause other abnormalities. Early correction of stenotic nares and/or an elongated soft palate will significantly improve airway function and may prevent development of everted laryngeal saccules. The overall prognosis for patients with brachycephalic syndrome depends upon how many anatomic abnormalities are present, and how old the dog is at the time of diagnosis and treatment. Dogs under 2 years of age at the time of surgical correction have a better post-operative prognosis than dogs that are older. Dogs that only require surgical correction for stenotic nares and/or an elongated soft palate have a better prognosis than dogs with more defects. Dogs with a hypoplastic trachea have a variable prognosis. Dogs that have other problems such as allergic airway disease or that have developed secondary problems from the airway distress have a poorer prognosis. However, appropriate management can significantly improve the quality of life for these pets. "...dogs that require surgery to correct airway obstruction should not be used for breeding." This syndrome is directly related to the conformation or breed standard for brachycephalic dogs. Dogs with pronounced breathing difficulty or dogs that require surgery to correct airway obstruction should not be used for breeding. It is usually recommended that these dogs be neutered at the same time that the surgical correction is performed.